Ashley West is a corporate and real estate lawyer deeply committed to her clients’ success. She operates primarily out of our Sacramento office, serving clients both local and global. Mergers and Acquisitions. Ashley West has closed over $3.5 billion in mergers and acquisitions, including asset acquisitions, stock purchases, and mergers, across a diverse set of industries including hospitality, health care, technology, manufacturing, insurance, retail, solar, and mining. Business and Real Estate Transactions. Ashley serves as outside general counsel to many of her clients, troubleshooting operational issues, providing general corporate counseling, and negotiating mergers and acquisitions, commercial agreements, leases, and financing. 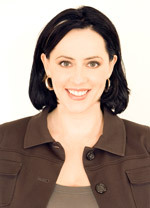 Ashley counsels corporate boards, officers and management on day-to-day and strategic business decisions, often advising them as to their fiduciary duties, contracts, trademarks, real estate matters, sales of goods, vendor agreements, license agreements, collateral issues, contract disputes and other operating issues. Ashley has formed over 300 companies. She has represented corporations, partnerships, and limited liability companies through all stages of growth and development from formation to sale. Ashley regularly negotiates and prepares agreements for the sale, lease and finance of real estate.